This print and apply system with a leading panel corner wrap assembly and pneumatic roller impresser. 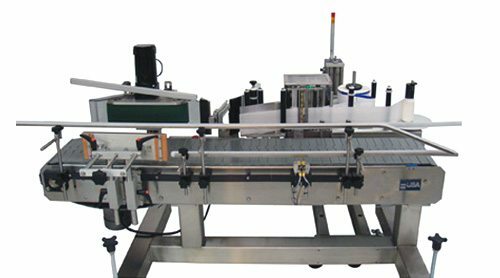 The print and apply labeling system predispenses a label to the leading panel module, the label is applied to the leading panel and the pneumatic roller impresser completes the label wipe down onto the side of the product. To label the pails, the print and apply applicator prints and applies a label to the side of the pail. The wrap station completes the label wipe down as the product spins. Additional features include a custom width and length stainless steel conveyor, guarding for the wrap station and custom product wheels.